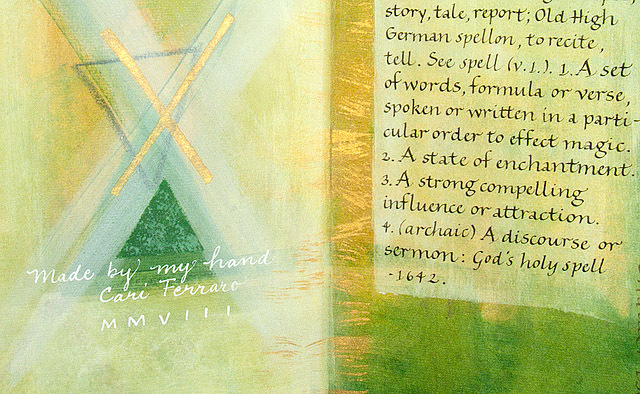 Unique calligraphic manuscript books, in a series of three variants. 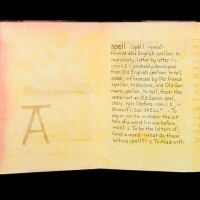 These books explore the roots of the English word “spell.” The content of the books presents the etymology of the word, from its original association with letter magic and the telling of stories (first appearing in Beowulf and later in Chaucer’s work), and juxtaposing it with its more ordinary meaning in the present day. 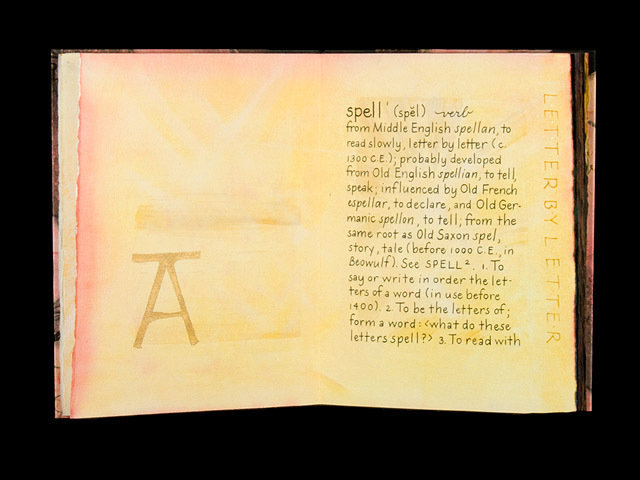 Each book has two beginnings which meet in the center spread where it may be turned over and read again from the other direction. 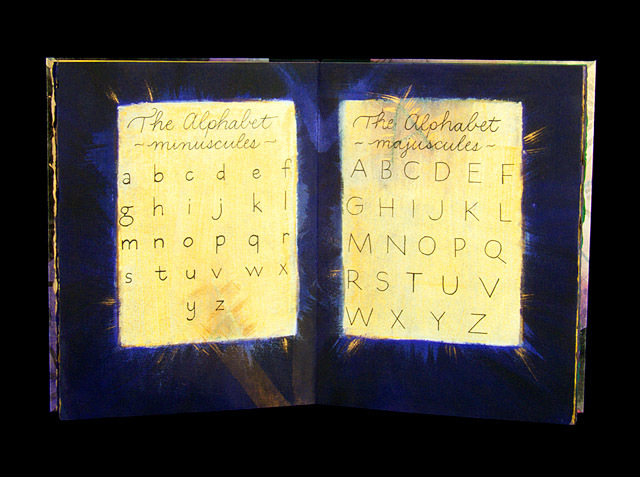 Thus the book has two beginnings and no ending. 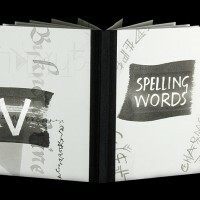 This type of binding is referred to as tête-bêche, a French term meaning “head to tail.” Each side of the book begins with dictionary definitions of the verb and noun “spell”. 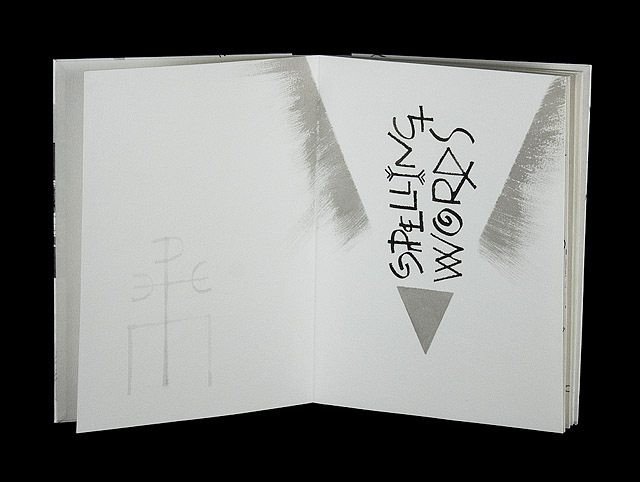 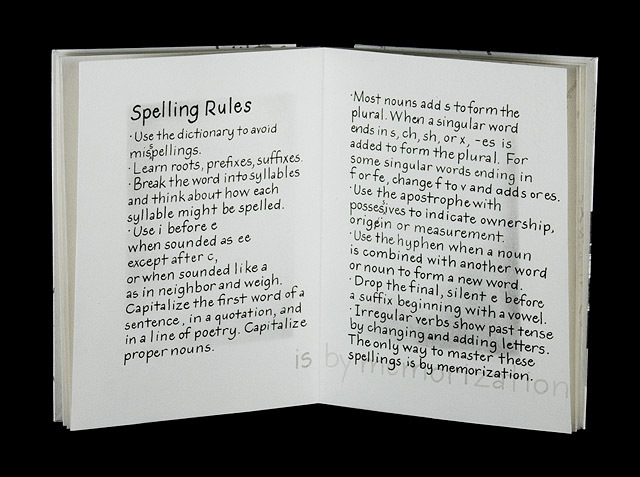 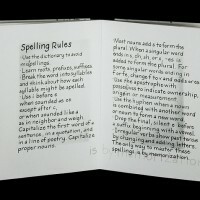 Alphabets, symbols, and various rules and instructions for spelling fill the other pages. 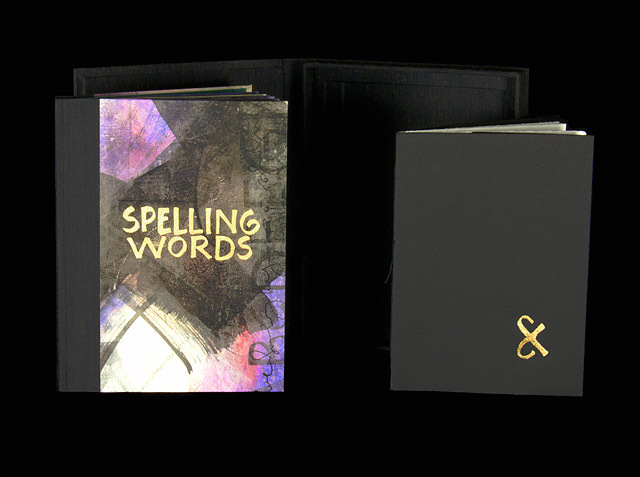 The content is similar but the presentation varies from book to book. 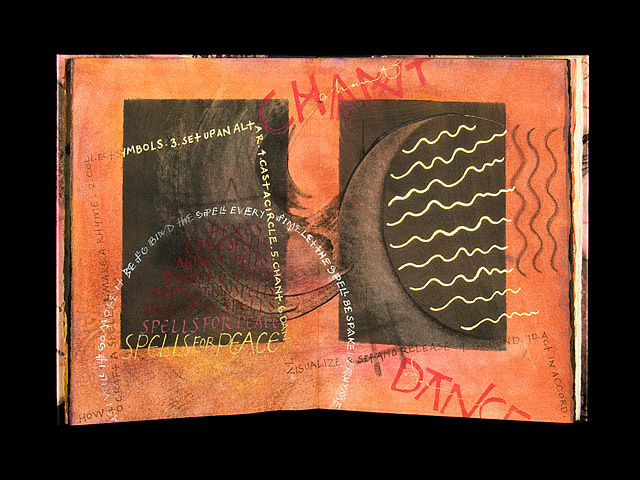 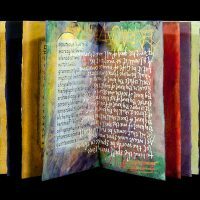 An encounter with this book is a magical experience in itself, and rewards the reader with many layers of meaning and secrets, some hidden in the margins, creating an enchantment not unlike the illuminated books of medieval times. 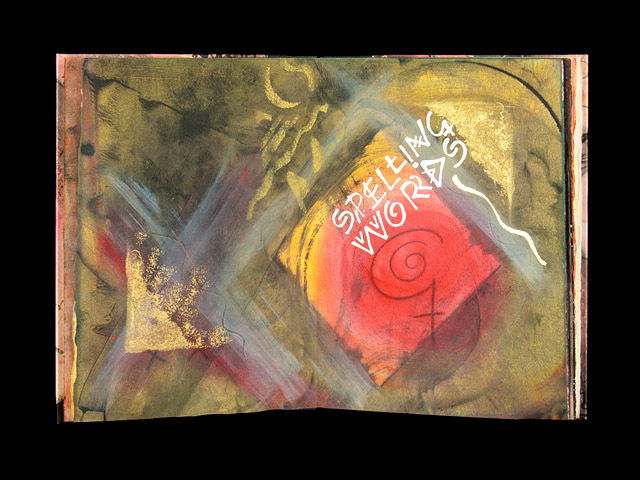 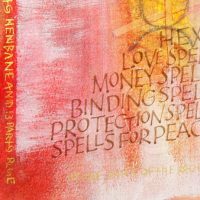 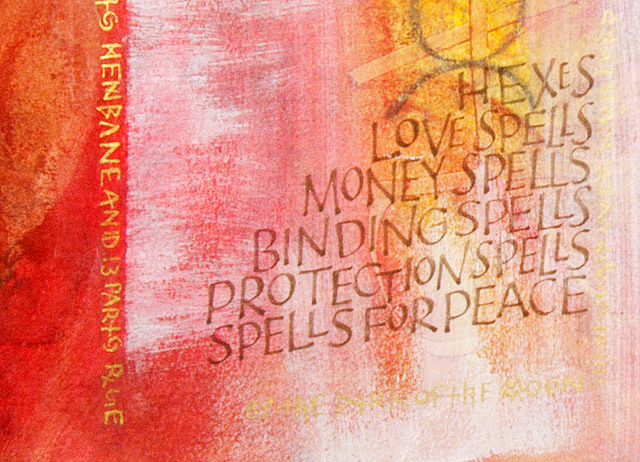 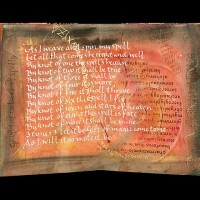 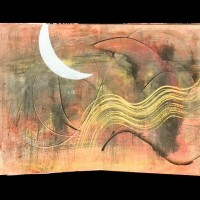 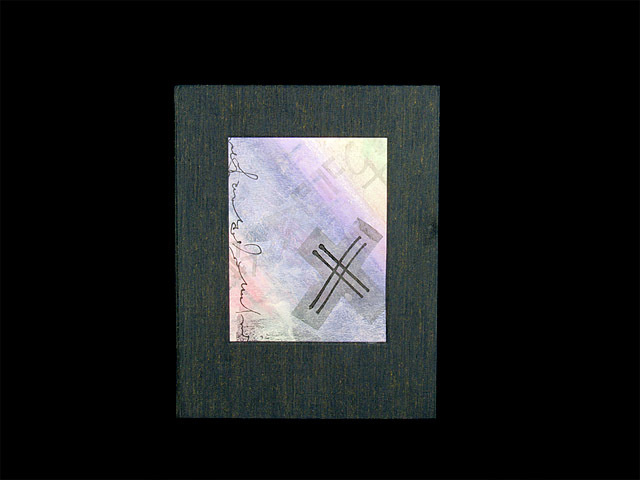 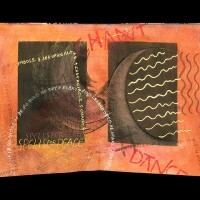 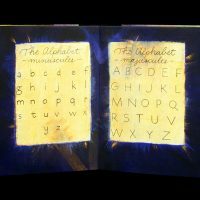 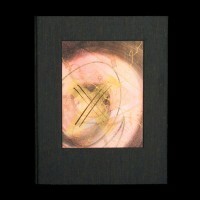 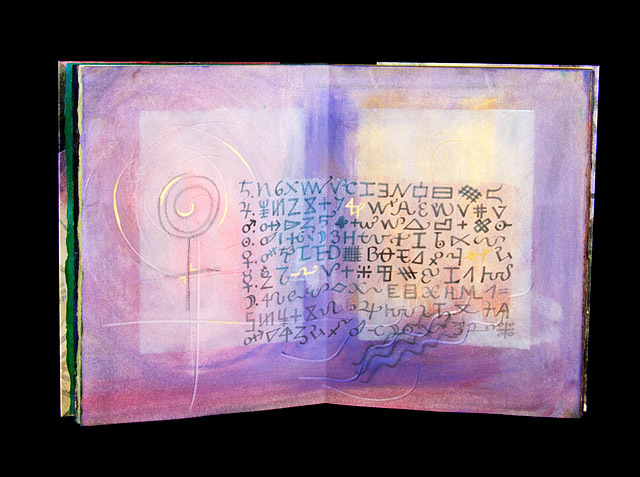 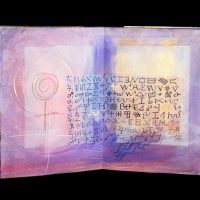 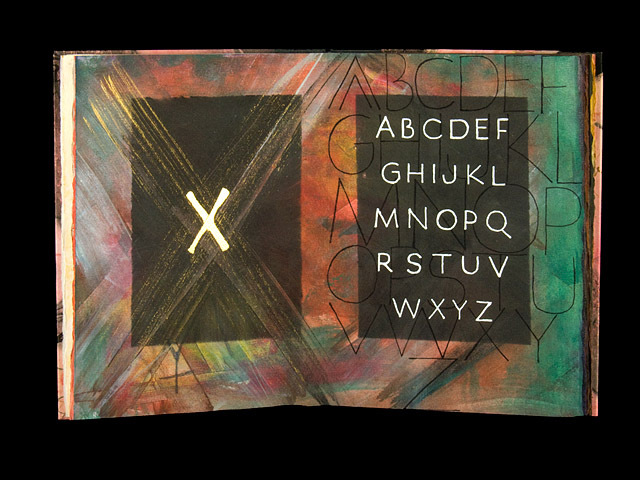 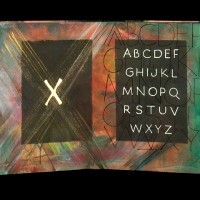 The pages are painted with paste and acrylic, over the first layer of symbols and letters made with oil pastel. 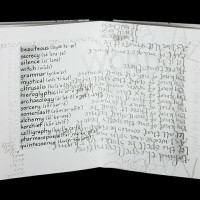 Pochoir is used to define the text blocks which contain the text in the mundane half of the book and fail to contain it in the magical half of the book. 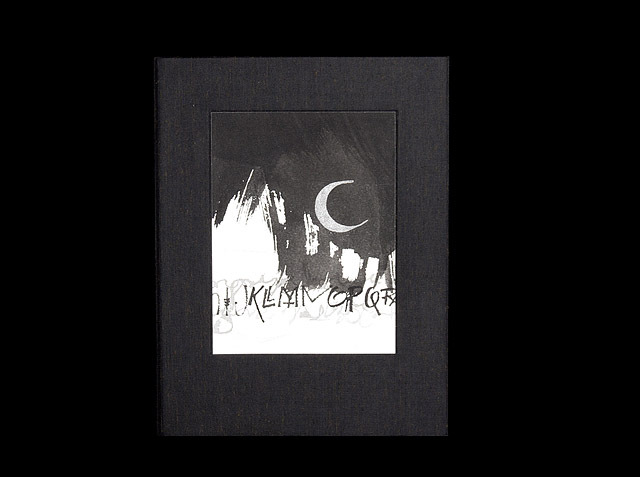 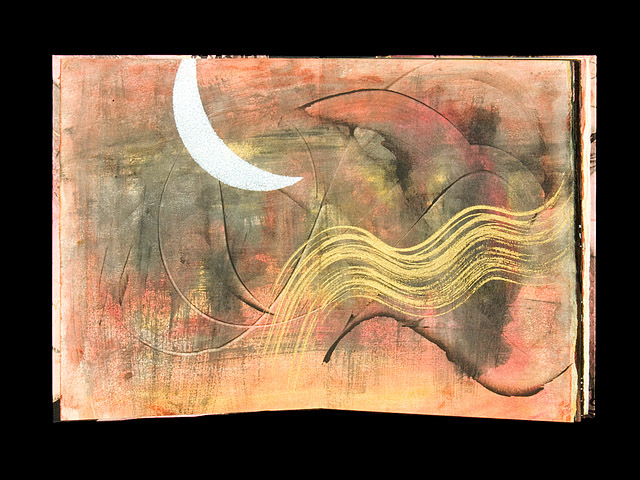 Calligraphy, handwriting and painting are added throughout in black Sumi ink, gouache and iridescent acrylic inks using broad-edged pen, ruling pen, folded pen and brush. 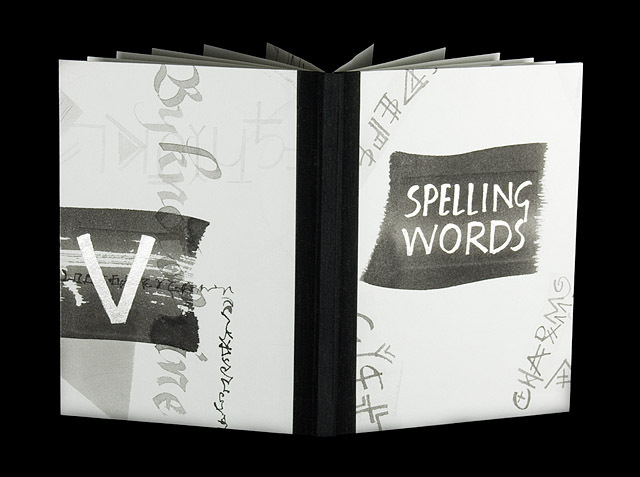 Cover boards are covered in hand lettered and painted paper; bound in the drum-leaf style with a cloth-covered spine. 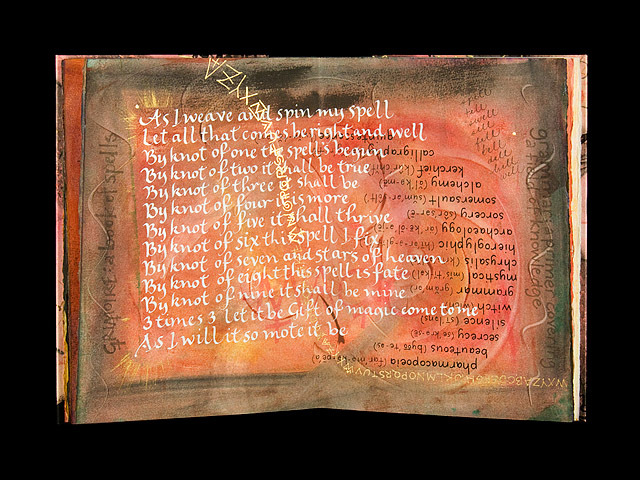 The third variant of the book, shown at top, has titles and highlights throughout book gilded in 23K gold leaf, and pages in shades of rose, gold, ocher, green, black and white. 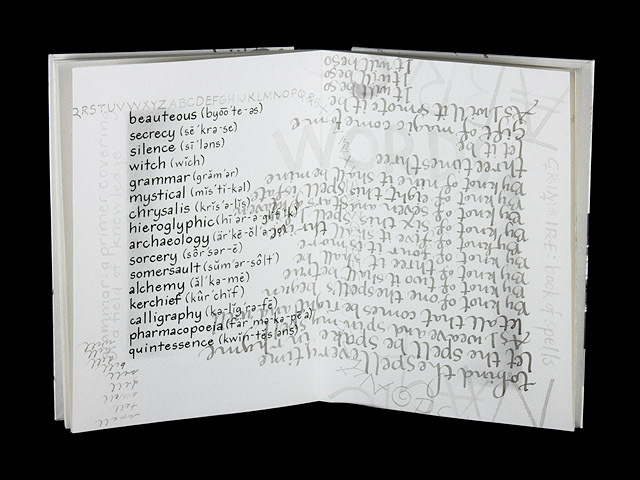 The second variant of the book, shown in the middle, has titles gilded in platinum, and pages in black, white and gray; this is the “reader’s” variant. 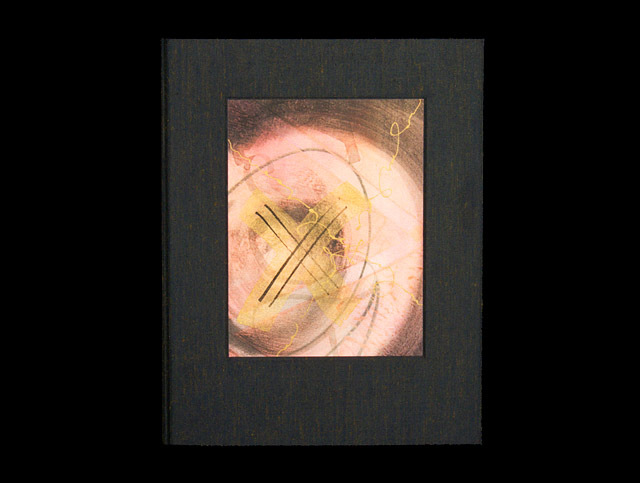 The first variant of the book has titles gilded in 23 K gold leaf and gold iridescent ink highlights throughout, with pages of ocher, purple, green, rose, white and black. 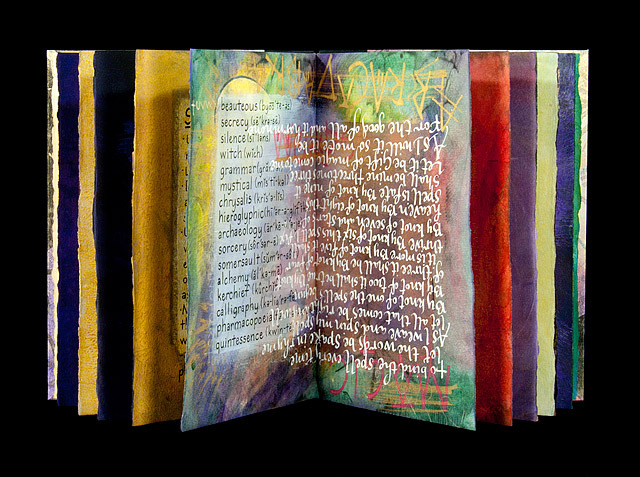 Books are each housed in cloth-covered drop-spine boxes made by Don Drake of Dreaming Mind Bindery, Castro Valley, California. 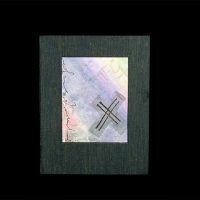 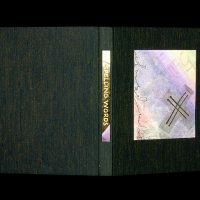 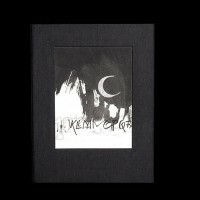 Included is a separate 14-page booklet called “Backstory” which lists a bibliography, acknowledgments, an artist’s statement and the colophon, bound pamphlet-style in black paper with gilt design on lower right front corner. 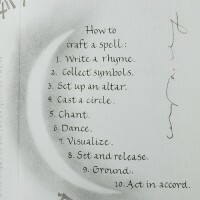 Extensive research through many dictionaries, arcane and contemporary books of magic and books of philosophy went into the creation of the content. 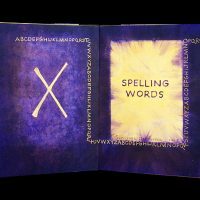 A thousand years ago, to spell meant simply to tell a story. 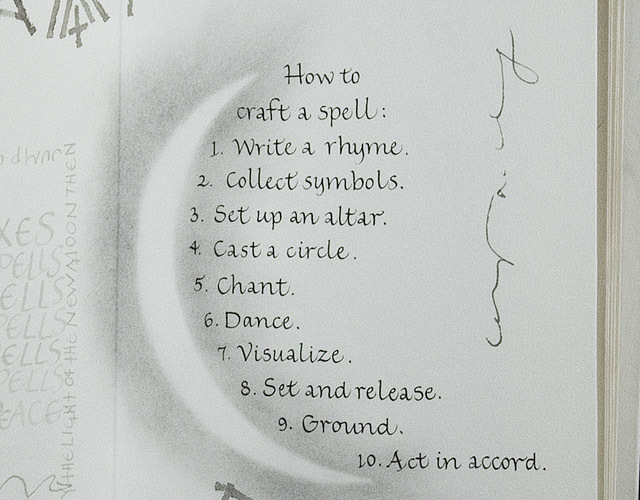 Bards used alliteration and rhyme to remember the correct order of a story. 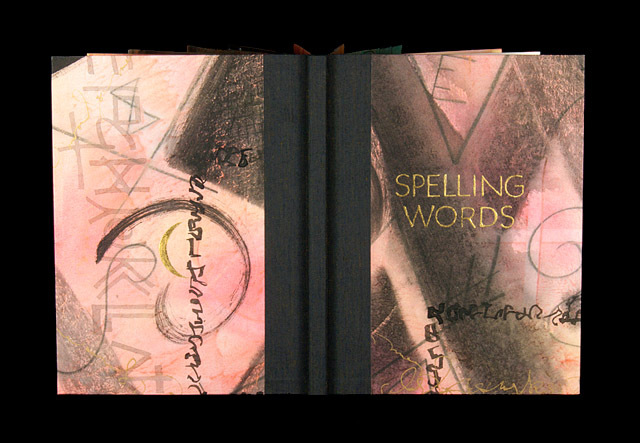 Later, as stories were written down, spelling began also to mean correctly arranging the letters of a word. 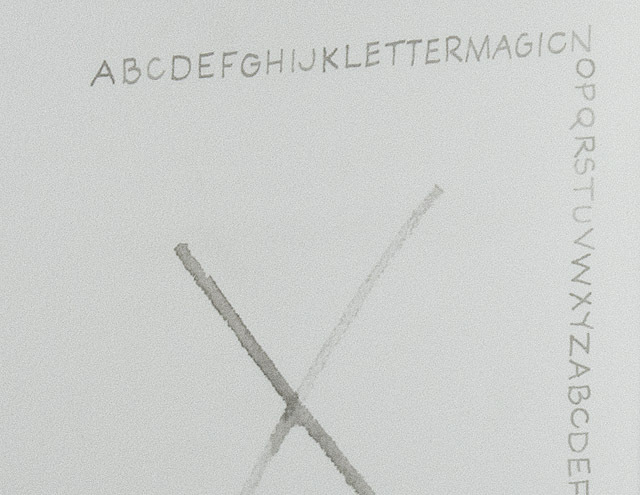 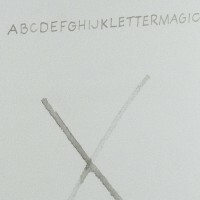 In the proper ordering of the letters, the magic of retrieval was possible. 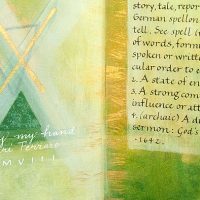 Thus was the magic of verbal charms transferred to the writing of letters, making the letters themselves instruments of power, named entities, full of divine nature. 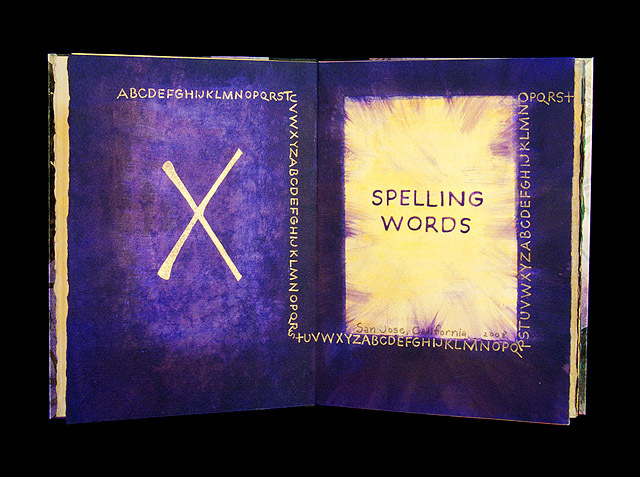 Spelling Words (the first): Santa Clara University Special Collections, Santa Clara, California. 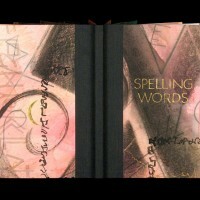 Spelling Words (the second): artist’s collection. 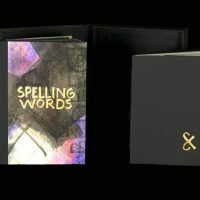 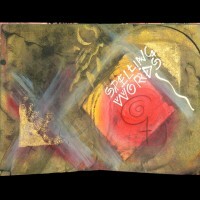 Spelling Words (the third): please contact me for availability.